We spotted Gabe playing with water in the toilet bowl and being a distance away, the first natural reaction was to yell at him to stop. Next thing we knew, he covered his ears with his pair of wet hands (yuck! ), squatted down, hiding his head between his knees and started whimpering. ... coz I just saw the future. I just saw what would become of Gabe when he grows up. It will be that time where we are no longer around to take care of him 24/7. He will have to fend for himself on his own. It will come to a point when he does something wrong unknowingly and end up having people yell or worse beat him. What happened in the bathroom, I foresee is what will play out in the future where he does not know how to take care of himself, let alone defend himself. May God have mercy on you. Gabe. Time is on Gabriel's side. With the right training and education, I'm confident he can live a self sufficient life. Just keep those kiasi, kiasu, ignorant parents/teachers away. Then again, with a dad like that, normal isn't enough. Let's all hope Gabe will mature into a mini-Jaywalk. i'm sure people out there would understand and be more tolerant towards gabriel. Hey , dun be discouraged. he's still young, i m very sure he will learn more and alot along his formative years.. dunch worry even when u r not ard, u still have plenty of friends to be relied on. Maybe you shouldn't have yelled at him at the stage of impulse? I am quite sure he will be fine when he grows up. Paperman: I do not harbour any hopes that he will one day catch up with the rest of the normal kids, if at all. Instead I rather let him grow at his own pace but problem is that would it be good enough? msvindicta: More people are starting to understand autism more as we are seeing more and more cases of this. Problem is that it takes one bigot to ruin everybody's day. JF: Well, yes and no. While it's good to have friends around to help out, ultimately one still need to be self reliant as one cannot always depend on other people for help. 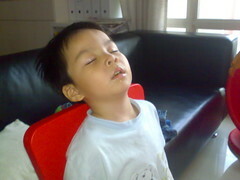 Old Beng: Being autistic, it is really hard to get his attention, if at all. I guess yelling was just an instinctive reaction from us. Well, not exactly yelling but more of a loud exclamation. nerak & everton: Thanks for the encouragements. I teach autistic children on a daily basis and my 2.5 years old nephew is autistic as well. With early intervention, they will adapt to the environment just fine. There is no 100% cure but they will definitely improve. Patience is the key. Parents must stay strong and united to do this together. There will be trials and errors so don't fret. I think to be fair, autistic children has a fair chance if early intervention is given. Patience is the key word. I can understand that every parents has expectations of their children, but sometimes the expectations needs to be managed. We all want the best for our children but sometimes we overshadow their needs with our expectations. fitti & mistress grace: Thanks for the kind words of encouragement. Read my subsequent entry. If I had a parent like you... I would be the happiest little girl growing up. Joyce: Oh you flatter me. If you know me better, I am a long way from being a decent parent.